At Capital, you?ll find nasi dagang with a pedigree. NASI dagang, or ?trader?s rice? is typical of the East Coast. It?s a quick nutritious meal served at small warungs by the sea, or in fishing villages. At its simplest, it comprises rice cooked with coconut milk, with a little bit of fish curry ? all ingredients that are easily available, and native to, the fishing communities that dot the East Coast. Not all nasi dagang is created equal, however, with the Terengganu version using white rice, as compared to the uneven-coloured local variety of rice used in the Kelantanese version. Curries also vary between the two, and the Kelantanese version may incorporate pickled vegetables. away in brown wax paper, artfully wrapped, with a thick coconut curry and chunks of ikan tongkol, a variety of tuna. The Chinese refer to this fish as ?wood fish? which gives a clue to its rough, meaty texture. Nasi dagang has its share of fans in the Klang Valley, where, far from its East Coast roots, it is quite popular for many migrants hungry for a taste of home. A number of restaurants serve nasi dagang, and although it has never gained the universal popularity of nasi lemak, aficionados of nasi dagang will seek out authentic versions of this dish. It was on a friend?s recommendation that I visited Capital Nasi Dagang Kelantan in Damansara Utama. It had been open for barely a month, yet on weekend mornings, it was already crowded with a mixed crowd. The restaurant was simple, and hearkened back to its small-town roots, for besides the tables and chairs, the most notable thing was the side stall with deep food trays. Inside were beef rendang, ikan tongkol curry, prawns, chicken curry and squid curry. On a counter behind was a large heaped dish of freshly cooked nasi dagang, still steaming hot. 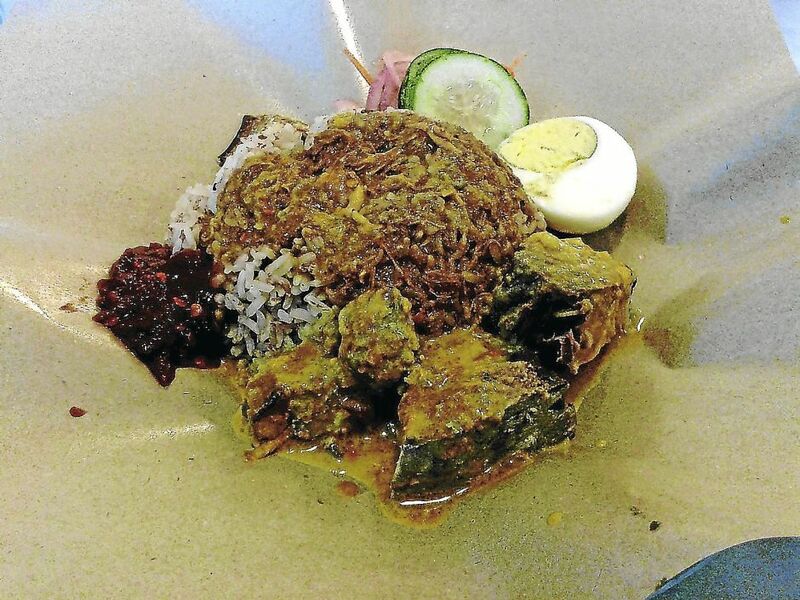 Hailing from Kota Baru, Capital Nasi Dagang is well-known, and the food frequently runs out by mid-morning. The menu also reminded me of a kopitiam. The main item was nasi dagang, served with a choice of side-dishes such as beef rendang and squid besides ikan tongkol. For the true kiasu, there was the ultimate Nasi Dagang Capital, at a whopping RM18.90, incorporating all the side dishes. I ordered the basic, and original nasi dagang with gulai ikan tongkol (RM7.90). The woman behind the counter assembled the dish, and it was served quickly, in a sheet of brown wax paper on the plate. The portions were delicate, reminding me of morning breakfasts in Kota Baru where people make do with smaller portions than we?re accustomed to in Kuala Lumpur. There was a scoop of the brown rice, with a chunk of fish in curry, a teaspoon of red sambal, half a hard-boiled egg, and a few slices of pickled onion and fresh cucumber. There was also a very small portion of fried salted fish ? all very modest. The gulai, or curry, was rich and thick, and obviously prepared with coconut milk, as is the case for Kelantan nasi dagang. The rice had been freshly steamed and appeared light and fluffy, which was no easy thing to achieve. It smelled fragrant, and I mixed the rice with the gulai, and broke off a little chunk of the meaty, dense fish, and took a mouthful. The rice was surprisingly light, not sticky or heavy, and the curry was beautifully creamy and thick. The pickled vegetables and very small nibbles of the salted fish added variety and texture. The sambal was sweet and fiery, and just a little smear added colour and flavour to the nasi dagang. It brought back a flood of memories of Kota Baru, of small restaurants, where the conversation was coloured with the local patois, the nasi dagang delicious, and the local coffee, fresh and strong. It reminded me momentarily of the flavour of Kota Baru, with its rich assortment of foods, the busy, colourful market with the makciks in their colourful sarungs selling fresh vegetables, and the fresh, warm breeze bringing with it the salty smell of the sea. Such was the authenticity of the dish. It wasn?t surprising. I was told that all the ingredients came from Kelantan, and that the food was prepared by the very same matriach who had sold nasi dagang in Kota Baru for all those years, now transplanted to the Klang Valley. We also ordered roti bakar kahwin (RM3.20), a traditional kopitiam favourite. The Chinese coffee shop bread, which is white and fluffy, isn?t particularly filling or nutritious, but when it?s been toasted, and slathered with a thick layer of butter, mated to sweet, home-made kaya (coconut jam), it suddenly reminded me of childhood all over again, and a much simpler life, when sheer pleasure was roti kaya with a cup of coffee. Kelantanese laksa is almost austere in its simplicity, yet it balances flavours, taste and textures in a single dish. Full, but not completely content, I had to try the laksem ? Kelantanese laksa (RM6.90) for it sounded interesting. 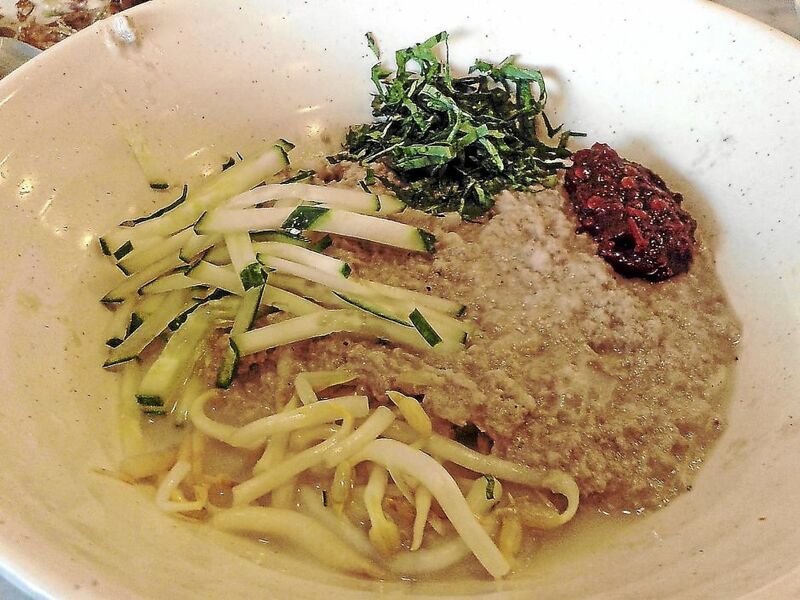 It came in a large bowl, a small portion of home-made rice noodles, in a thick white sauce, smothered with minced fish. Small portions of uncooked bean sprouts, sliced cucumber, chopped herbs and a teaspoon of sambal had been added. I mixed the whole bunch, and took a good mouthful. The noodles were firm and springy, and the gravy was creamy, rich with coconut milk, thickened and flavoured by the minced fish. The vegetables perked up the dish considerably and enhanced the taste. I liked the simplicity of the dish. The raw favour of the vegetables contrasted well with the smooth creaminess of the laksa and the gravy. It was beguilingly simple and yet artful in a beautifully balanced, evolved way. The chicken curry is sweet, spicy and thick and just the thing for dipping toasted bread in. Yet another intriguing item on the menu was roti curry (RM6.90), comprising chicken curry with a large portion of toasted bread cubes. The only way to eat this was by dipping the bread into the curry with chunks of chicken. The curry was also very rich and thick, and it was surprisingly sweet, which was explained to me as the way Kelantanese like their curry. I liked Capital Nasi Dagang for its honesty and simplicity, for it made no deliberate attempt to be an old-style kopitiam, such as using old-fashioned saucers or black-and-white pictures of someone?s grandparents on the walls. It was authentic in a way that couldn?t be replicated; it was a small, family-run business with home-made ingredients, with nothing fancy or contrived on the menu. Family members ran the business, from the mother preparing the dishes to members of the family taking orders. The proof was in the eating, for here was nasi dagang with pedigree, a little niche of Kota Baru, that, if you came from Kelantan, had the taste, and brought back, the memories of home.